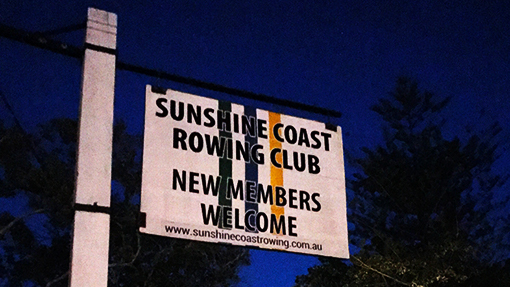 Obligation free introduction to rowing on the Sunshine Coast. Please register to attend. See you there! On the river introductions are easy! The Club usually runs 2-3 courses each year from our club house on Chambers Island. Our Learn-to-Row program provides the fundamentals of how to row competently and safely. 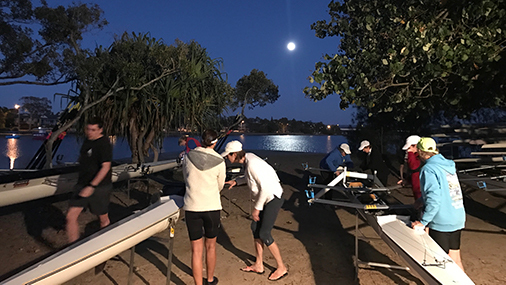 The program follows guidelines set by Rowing Queensland and the lessons are conducted voluntarily by experienced club members who are certified as Rowing Australia Coaches. We hope that you would wish to continue rowing on conclusion of the course and if so, you may join our Club and receive on-going coaching, to attain higher levels of performance or simply to enjoy recreational rowing. Where: Chambers Island, Maroochydore on the Maroochy River. Take the footbridge across to the island at the traffic lights on Bradman Avenue near Swan Boat Hire. Time: We ask attendees to be at the club by 5.30 am to permit orderly planning of the sessions. We normally spend over an hour on the water, followed by boat cleaning with conclusion by around 7:30. How many sessions? The fee is for a series of 8 sessions that runs on consecutive Saturdays. Note: We regret that sessions missed cannot normally be made up. 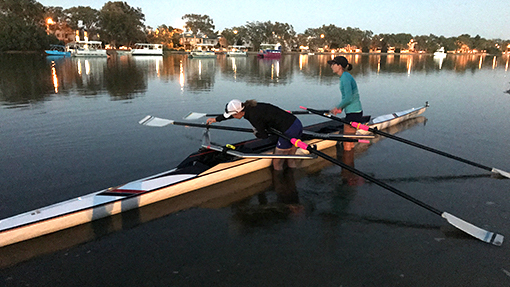 Fee: $200, including Rowing Queensland Insurance levy, payable before the first session. There can be no participation without payment. Payment: An invoice will be emailed with the amount and payment details upon your enrolment for Learn to Row. Contact: LearnToRow@sunshinecoastrowing.com.au for more information and the next course commencement date. What to bring: Sunscreen (required even on cloudy days) and a water bottle. Clothing: Loose clothing may get caught in the equipment so only close-fitting items should be worn but not so tight as to restrict movement. A cap or hat is compulsory for sun protection & controlling wind-blown hair. Slip-off footwear is desirable for launching boats. Socks must be worn when rowing. Participants must satisfy themselves that they do not suffer from or do not contract any medical condition which would preclude them from undertaking this activity. Participants must be able to swim 100m when dressed in rowing clothes. Facilities: The club has access to changing rooms & toilets.